I can’t believe how fast we are flying through this challenge. We are already on week 4 with only two weeks left. I don’t know about you, but it seems like the older I get, the faster time goes. I’m sticking with this challenge pretty darn well. I’m losing pounds (although not huge amounts) and doing pretty well with what I am eating. The exercise part has been hard with getting started back to school and getting back to a routine. It’s okay though. This week has been good with walking and classes so far. How about you? Are you keeping on track? Now is the time to run and jump on that scale and check in on your weight. Good news, I hope. Christy had mentioned last week about food journaling. It made the hugest difference when I started doing that. I use My Fitness Pal and don’t think I could do without it now. If you don’t keep track of what you are eating, you really should. Make sure you leave your weigh in results in the comment section. We have a giveaway going on for a Baboosh Body Wrap. You have till Friday to enter. Don’t forget to join our Shrinking Jeans Summer Blowout Weight Loss Challenge Group on Facebook. It’s a great place to get support in your weight loss journey, and since it’s a private group, nobody but your sisters at the hood will know what’s happening with your weight loss! One lucky person who leaves a comment TODAY will win a fantastic prize pack from Active Accessories and ToiletTree Products! 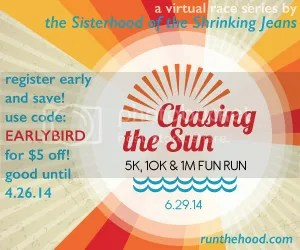 Last, but certainly not least, be sure to sign up for our next virtual race! Check out our Ghostly Gallop at race central. You can do the 5K, 10K or the Fun Run. These races are a total blast. Get your family and friends together and join us. You’ll have a great time. down a little, not much. Need to eat better. 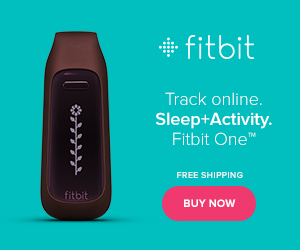 My last check-in was not a good one…I had an off week, and my motivation was no where in sight! This past week, I wasn’t feeling the greatest, so my workouts were few and far between, but I kept my calories under control and I’m down 3.8 lbs THIS WEEK!!! That’s a total of 4.4 for the challenge! :) So exciting to see the number finally going down!!! No real change this week, which is good. I was pretty sure I would be up a couple of pounds. Slow and steady progress! So thrilled to actually see a loss this week! Down 1.6!! Hopefully my body just needed time to adjust to the added exercise I have been doing. Heres to the last 2 weeks!! Down a little, but I consider ANY loss with the stress of the last week to be a victory. Back to full focus today! So I have gained a pound from last week but I thought that would happen as I went to the DMB concert in the gorge and did nothing but I ate a little too much and probably drank a little too much. But it’s a new week and I am bound and determined to lose 5 lbs by the end of this 6 week challenge I will be 180 lbs when this is over. I will! I’m up a little again…thinking I’m at my plateau weight…since I haven’t been under this weight since 8th grade. Seriously! My body is totally like “huh?” Learning to let that go and strive for better fitness goals. I”m down .2 this week. i really need to get back to what works and stop thinking I can skip steps in this process! back to tracking everything I eat and drink! Still holding steady at between 1& 2 lbs lost from my original weigh in. I have pretty much given up on the scale & am using this as a fitness challenge, which is totally working! I have lost a half in in my waist & his in the last month! Whoot! no change this week. Started the C25K this week, and back to logging my meals. Gotta set myself up for success, am I right?! Good luck this week! Down 19.5 pounds for this challenge. Doing good! I’m down a lb! I think I was restricting to many calories. Finally some good progress. I think I stayed the same this week, but feel great. After 4 straight days of a total epic fail on my eating I was able to pull through the past few and get back on track. I’m also on Day 4 of the Whole 30, wrapping up my birthday by cooking my first sweet potato even then hitting up a yoga class. I think the turning of a new month, a new age, and just an overall sense of pull your sh#$ together is giving me the day to day motivation I need. Congrats on the awesome weight loss so far ladies. You are inspiring! I’m gained back the two pounds I lost last week… I’m not a happy camper…. But that’s okay, I’ve started this week off on a good note, day three at the gym and loving it. I won’t let this get me down! I’ve been yo-yoing between my starting weight and losing 4 pounds. I’ve been changing things, but I guess there needs to be more change. Well I have been doing really well at maintaining my weight the only part I need to get rid of is the fat around my middle. Other than that my weight is doing fine. My energy is coming back since I have been doing this program. Down 1.4 lbs for a total of 7.5lbs since I started. I love My fitness pal. knowing what I am eating and keeping within my goals makes a huge difference. I have been moving more and making smarter choices. I don’t really want to check in. I’m having a hard day. I lost 8 inches this week, but weight is what counts on this challenge and I’ve gained 2 lbs. I am back at 190. I feel like I will never get out of this freaking stall. I’ve been in it for 8 months now. I’m so frustrated I just want to jump into a cheesecake and eat my way out. I am beginning to think this is the weight my body wants to be but its not the weight I’m comfortable with. I get to listen to my dr lecture me again next week. I am ready to quit. Chin up, Margaret! I hate the idea of my body being comfortable at a weight that I have issues with, too. The idea is to not quit, just keep trying or try something new. You can hang in there! Down to 168 from 172 ish I think! Went on vacation to my parents house, exercised while I was there 3 out of 7 days and kept track of what I ate…over on someday but overall I feel like I did really well! Feeling great and running more too!! Finally budged a bit this week. Down 2 lbs! Woo Hoo!!!! Sure seems like it should only be week 3… did I miss a whole week???? I’m down .2 pounds but I guess it is better than nothing. No gain no loss. I hate this stage. I am down 2 pounds today but still up from the beginning of the challenge. Goes to show what happens when you don’t focus on what you know works. Gonna get back on track now….. I am down two pounds!! Woot Woot!!! I’m up .4. I don’t understand I’m working out more drinking more water and eating better. No gain no loss. Just stuck!